I've been wanting to try Your Bijoux Box, and when they offered a grab bag to get 5 items for only $25 I couldn't resist. I thought it would be worth it, even if I only liked one item. And jewelry always makes good gifts. I was so excited to see what I would get and I couldn't wait to open up the small box that arrived in my mailbox today. Here was my first look. 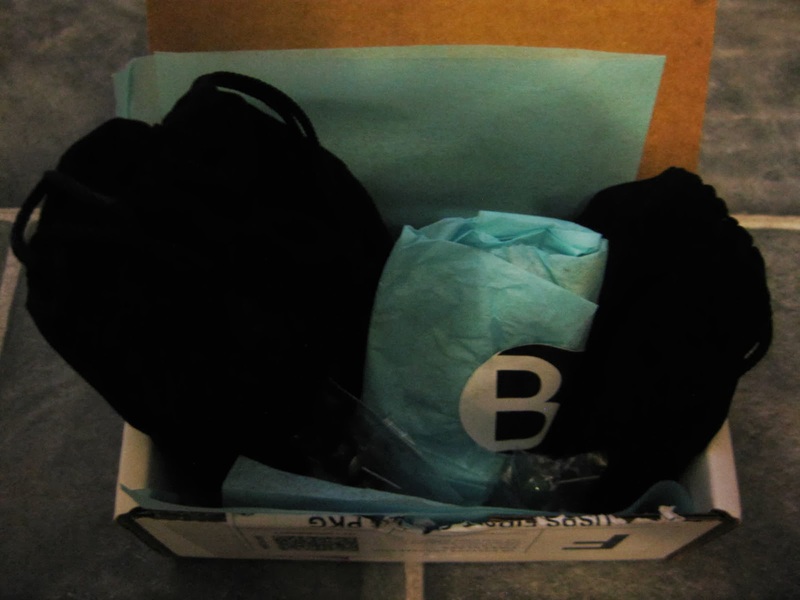 Everything was wrapped in pretty blue paper or enclosed in a black velvet bag. There were two sets of earrings in tiny bags and they were the first thing I noticed. 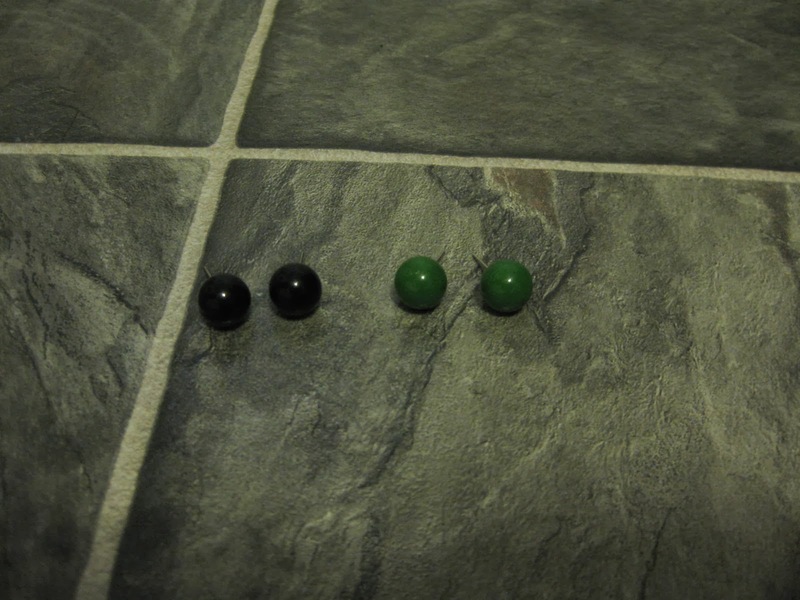 One set is black and the other green. They are the same size and not at all my style. I was hoping the rest of what I would open would not match these. The next thing I opened was in blue tissue paper. 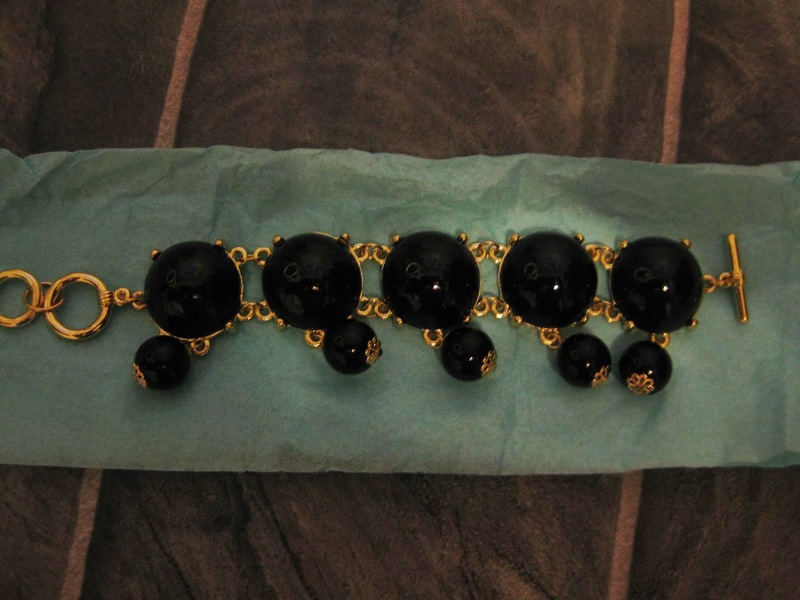 It was a bracelet with large black beads. I am a very tiny framed person and this is too large for my wrist and just looks strange. And it's gold and I prefer silver. This is another miss for me. And I can't think of anyone I could even gift this to. 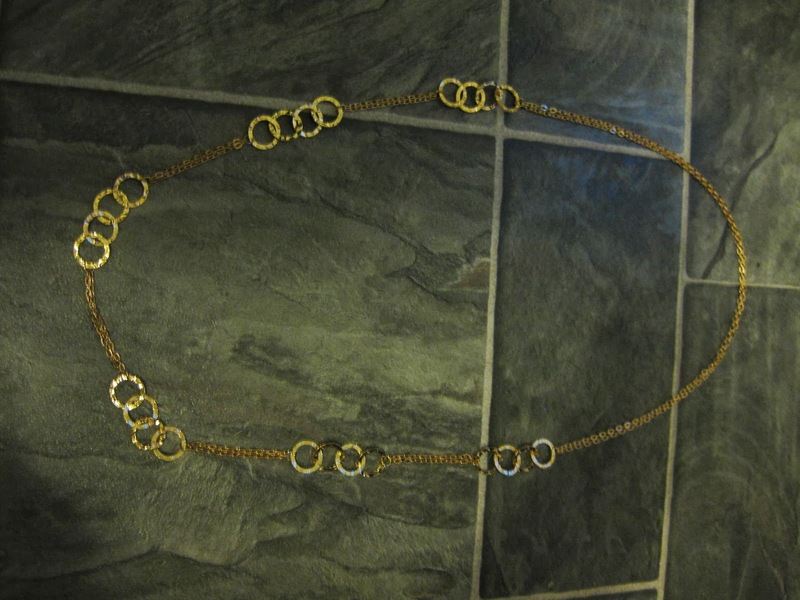 The next item was a gold necklace that is long with gold hammered rings. I can't wear long necklaces too often because my toddler loves to pull on them. And again I'm not a huge fan of gold. Another miss. So, at this point I was really hoping whatever was in that last bag would be perfect for me. 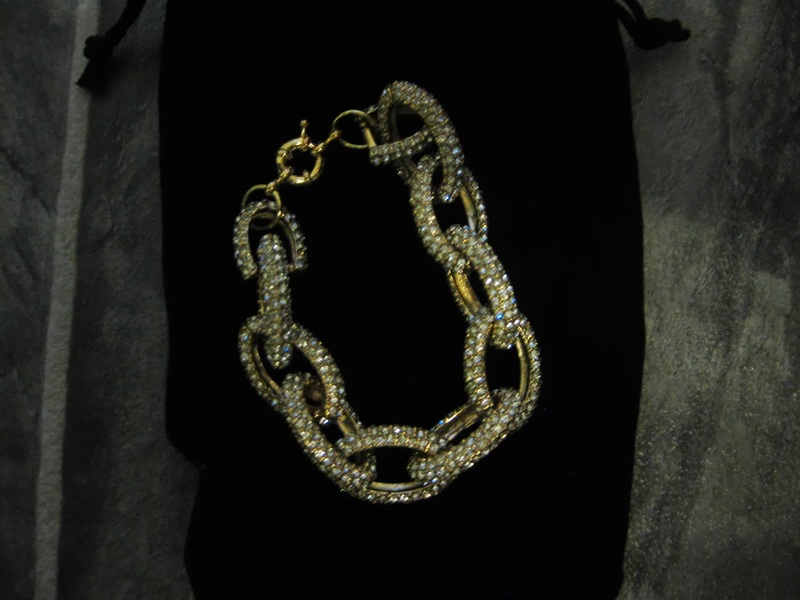 The last item was a sparkly gold link bracelet. I believe it may have been the spoiler bracelet for the December box. Again, it's gold and quite large for my small frame. So, I wasn't really crazy about anything I received in this box. Now I'm wondering if there is a place to trade with other Bijoux Box subscribers. Does anyone know of any? Really I'd be willing to give these pieces to anyone that would wear them, because they're just not for me. I've seen so many pieces of jewelry I've loved from Bijoux Box and I thought I would have received at least one piece that was my style. I'm totally in love with their spoiler piece for January and thinking about subscribing, so I get it. I would have loved to see something like this in my grab bag. Did you order a Bijoux Box grab bag? What did you get?